Today we are going to publish Common Digital Marketing Interview with answer. This question and answer are normally asked in all time of digital marketing interview. Here we collect top 8 question that asked In all digital marketing job. If you are preparing for digital marketing job, now your research is end because of here you will get your question and answer. You will get lots of interview question but I know still you are confused, which blog has perfect information. That’s why, I am publishing this article only for you my friend. Q) What is on-page and off-page SEO Optimization? A) In on-page SEO optimization you have to optimization your website structure but in off-page SEO you have to build some external backlink to increase your search engine ranking. Q) What is keyword streaming? A) Keyword streaming means spy your competitors keywords by keyword finder Tool and choice best website based on your website, by using this strategy you will get good result in search engine. Q) Can you please explain about Google Adword? A) Yes sure, Google adword called as a PPC (pay-per-click). Google adword help to create all types of ads like a Display ads, Text ads, SERP ads, video ads, etc. Q) Why do you need responsive website for better SEO? A) Responsive website it means Mobile friendly website. Mobile responsive design is one of the big ranking factor of Google because of 90% people search on Google from smartphone, so that reason you have to do your website design mobile friendly. Q) What do you understand by Google Adword Remarketing? A) Remarketing means someone already visit your website but they don’t purchase anything from you, but then you retargeting them and show your product ads that is Google Adword Remarketing. Q) If we will a hire you so what is your next six month strategy for our business? A) I can’t say anything about it because of Google update their ranking factor day by day and In SEO you make strategy today, nobody know tomorrow that strategy work or not. That’s why, I have no answer about any SEO strategy but when you will hire me I will do my best for Good sale and income. Q) How are you going to drag the attention of more and more number of potential buyers for the products /services offered by our business via Facebook or some other social media forum? A) For more and more potential buyers we need to retarget our previous website visitors and customers, because they have trust on our product and over service, that’s why we can easily sale our product to them. And big thing is we don’t want to expanse more money more marketing because we can sale our product to them in low marketing budget. This is very tricky question, the interviewer intends to learn whether you have come up for the interview mugging up the answers or you are well acquainted with every aspect hitched to digital marketing field and hence know who should be your target audience for more sale. 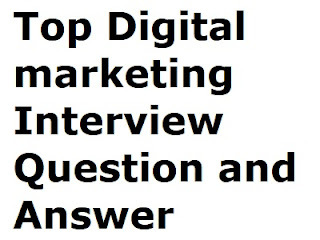 Note:- I hope my digital marketing interview question with answer helps you very much to prepare for interview. I hope all good well with you my friend.